An open source, web-based issue tracking system which features a user-level privilege mechanism, resource time tracking, hierarchical task dependency support, persistent session handling, task file attachment upload capability, task summary reporting, Excel worksheet generation and change alert email messaging. An open source application development framework which provides HTML template parsing, customizable components, rule-based HTML form processing, database convenience methods, session management, component debug output, and an error handling notification system. TWSurvey makes it possible for anyone to create a web-based survey. Surveys can be created through an interview process or by importing an HTML form to precisely define the survey appearance. Survey responses are saved in a database for analysis. The system can generate pivot table reports in HTML and Excel formats. 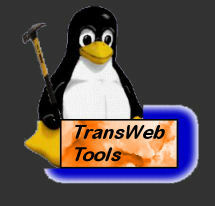 A reengineered implementation of the Problem Tracking System, developed using the TWToolbox framework. SPARCS provides all of the features of PTS, plus a number of new capabilities. Current status: requirements, design and schema are complete, coding at 65% complete.